Should Creatine Be Taken Before Workouts? Writing professionally since 2005, Ryan Haas specializes in sports, politics and music. His work has appeared in "The Journal-Standard," SKNVibes and trackalerts. Haas holds a Bachelor of Arts in English and creative writing from the University of Illinois. Though regular strength training will help you develop both strength and muscle mass, you may find your workout gains limited by physiology and diet. One way to boost your workout capacity is through creatine supplementation. If your physician states that it is safe for you to use creatine for muscle-building purposes, you should always take your creatine supplement after your workouts rather than before. Taking creatine before your workout can have a negative effect on your athletic performance because it causes your muscles to draw in water from the rest of your body and retain it. 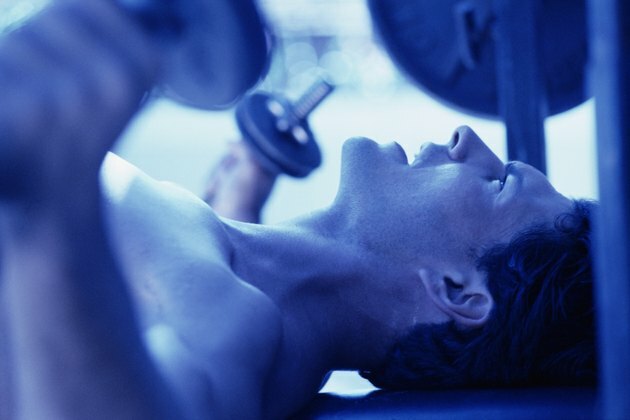 This results in your muscles looking bigger, even if they have not gained new muscle tissue. However, the downside of this fluid depletion is that you may experience muscle cramping and other side effects that inhibit your exercise. The American College of Sports Medicine released a position paper on creatine in 2000, stating that many of the side effects reported with creatine uses before exercise are anecdotal. These include effects such as nausea, vomiting, diarrhea and heat exhaustion. While the ACSM does advise only taking creating after exercise due to the potential for workout distress, the link to specific side effects with pre-exercise supplementation is tenuous. Because of the way creatine enhances your workout, you do not need to take it immediately before exercising to receive its benefits. After consuming a creatine supplement, your body converts the creatine to phosphocreatine and stores it in your muscles. The benefit of this is that when you perform high-intensity exercise, your muscles release this creatine and uses it to create the workout energy source ATP. Higher rates of ATP synthesis during exercise are what appear to enhance your muscle-building capacity with creatine rather than specific timing of the supplement before workouts. Sports nutritionist Jeremy Likness states that an effective creatine supplement program may involve taking 75 percent of your daily creatine dose immediately after exercise and the remainder before you go to sleep at night. He claims that this program will maximize the amount of creatine your body stores in your muscles. Additionally, the ACSM reports that consuming the creatine along with simple carbohydrates will increase the amount of creatine that converts to phosphocreatine. Does Caffeine Affect Muscle Growth? Can You Take Creatine & Protein Powders Together After Working Out?